Bartlett Family Dentistry has embarked on a new endeavor…blogging. Welcome to our first blog post! I thought it would be fun to start out with a BITE to eat! Part of the fun of being our patients or staff member is that we treat everyone like FAMILY! After all, it is our middle name. Today, at our office, we had a staff potluck lunch. Asking around, it seems all cooks have two main joys when cooking in the kitchen. One is to try new recipes. The second is cooking tried and truly yummy dinner dishes. So the foundation was set…potluck lunch. But around what theme should we set? The Pioneer Woman, Mrs. Ree Drummond, is so beloved by our patients and staff, I mean seriously, we all talk about all the good things she has going on at least once a day around the office. We have also tried and truly love many of her dishes. 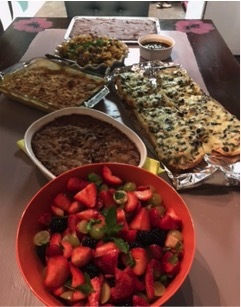 Then, it was finally decided that our potluck lunch would be called Pioneer Woman Potluck! Lemme jus’ tell ya...it was YUMMY! A more than a five-star meal! The whole office smelled so warm and homey that it didn’t even feel like we were at work! We gave patients a potluck sample to go with their regular goodie bags! They, of course, loved it and asked for an application for employment. For those of you that did not get a taste of our goodies today, here are the links to her fabulous recipes we fixed for our most delicious Pioneer Woman Potluck! How Fun! 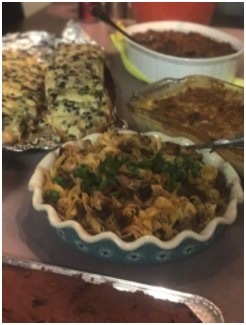 This was such a blessing to prepare, eat, share, and blog!! I am just praising The Lord for each bite and blessing today!